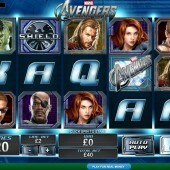 Ok, Marvel slots players! You had better take a seat because what I am about to tell you could well blow your mind. I know you really enjoyed the superb Iron Man slot. I know you got twice as excited when its sequel Iron Man 2 was released. You could barely contain yourself when The Incredible Hulk slot was launched and when the adrenalin-fueled Thor slot arrived you were beyond help. Well, now your dream has come true with The Avengers slot where all of your favorite Marvel superheroes are now included in one slot! Online slot developer Playtech did the impossible and followed up the smash hit movie franchise of the same name with a slot conversion that has become a massive success with Marvel slots players across the globe. This 5-reel, 20-pay-line slot offers as much excitement and variety as you could possibly want from a Playtech-developed slot that includes some of the most recognised superheroes and characters ever. The slot follows the same plot as the movie with the likes of Samuel L. Jackson, Chris Hemsworth, Robert Downey Jr, Chris Evans and Scarlett Johansson filling the reels as the superheroes Nick Fury, Thor, Iron Man, Captain America and Black Widow respectively. The group of superheroes, collectively known as The Avengers, must attempt to stop Thor’s nemesis Loki from destroying Earth with evil army. There are a number of stand-out features in this slot. There is The Avengers Assemble On Reels feature that is triggered when you hit Nick Fury, Iron Man, Thor, Hulk and Captain America on the same active payline. You will be awarded a win of 10x your line bet. It’s not a huge prize but it’s something to keep an eye for. There is also the Wall of Heroes Bonus that is triggered when you hit three Avengers symbols across the reels. This will reward you with the chance to play one of the four superhero bonus games to try and win prizes. You are presented with a wall of 20 Avengers symbols and you must select the symbols to try and reveal three images of the same superhero to trigger that superhero’s bonus game. The Captain America Bonus will see you awarded 9 free spins. Each free spin will see wins handed a multiplier value up to 5x. The first spin will have a multiplier value of 2x and this increases by 1 up to the value of 5x when the multiplier value is reset at 2x again. In the Iron Man Bonus, there is pretty much the same process. You will be awarded with 9 free spins and the multiplier value begins at 1x. This multiplier value increases by 1 after every 3 free spins. However, in this bonus, the reactor symbol remains fixed on the central reel and technically acts as an Extra Wild. The Hulk Bonus is slightly simpler in the fact that you have 9 free spins and the central reel is turned completely Wild by the Hulk Expanding Wild symbol. The Thor Bonus has an equal simplicity to it where you are rewarded 9 free spins and before each free spin Thor will appear to throw lightning bolts at random symbols and turn up to five symbols on the reels Wild. In addition to these bonus features, the maximum jackpot payout on this slot is a staggering 7,000x your total stake. This is possible to achieve if you can hit 5 Wild symbols and 5 random Extra Wild symbols across the reels on one spin. There is also the bonus that you could trigger the Marvel Mystery Jackpot at any time. 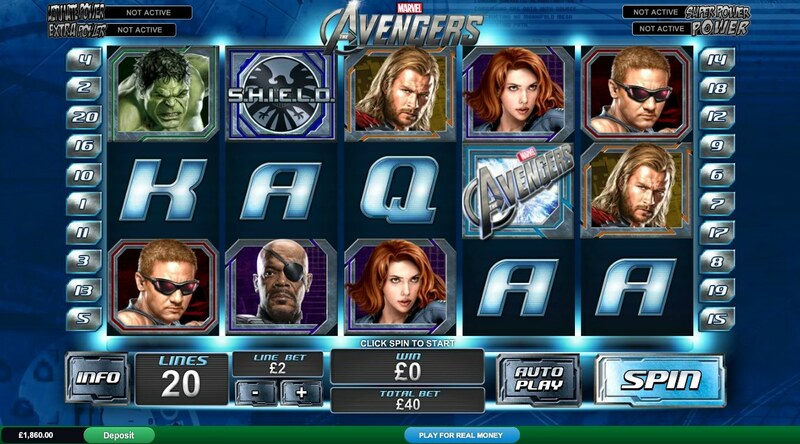 One downside of The Avengers is that the free spins cannot be re-triggered in this slot so even though the array of bonus games is attractive, when you see that you can only hit 9 free spins in one bonus game, it starts to look less appealing. That said, this is a really fun slot and anyone who enjoyed the previous Marvel slot releases by Playtech will definitely want to get their hands on this release.